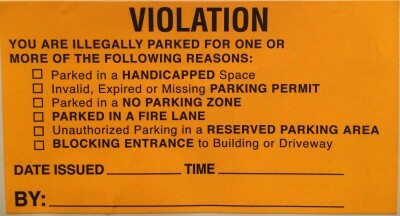 Parking Violation Stickers - are pressure sensitive stickers and have an adhesive for easy application to the windshield. 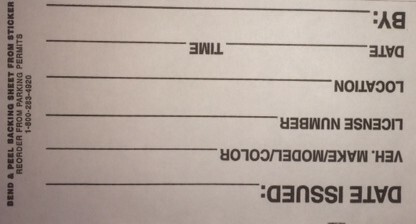 The release liner, when completed, becomes your record of the infraction. Standard sticker SIZE 5 ½" X 3". Call for pricing. Enforce parking lot compliance today with our easy to use parking violation stickers, warning stickers and warning forms. We provide high quality affordable parking lot control products to assist your school or business in monitoring and enforcing campus parking policies and procedures.